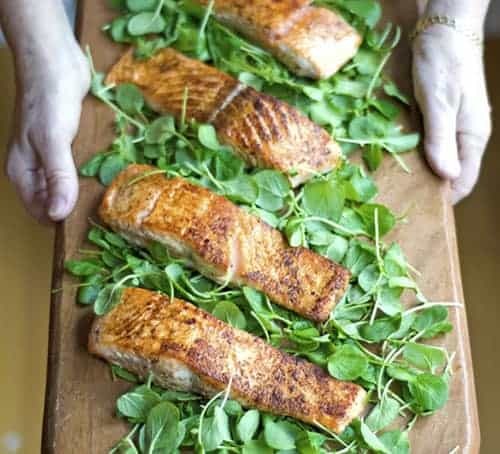 I grew up on this Simple Cajun Salmon. Both of my parent worked full time growing up, and it still amazes me how my mom would cooked dinner every night. Now that I am older I realize how lucky I was. That is why I had to learn how to cook. So I could enjoy and share the meals of my childhood. This salmon was in our regular dinner rotation back then. Now I know why! It’s soooo easy, and it only has 3 ingredients. Well played mom…well played..
Emeril’s Cajun Seasoning….that’s it ( well some olive oil too). That is all that is on this salmon. Why is it sooo good? Probably because it’s not complicated. You literally sprinkle as much seasoning as you want, then cook the salmon in a skillet. 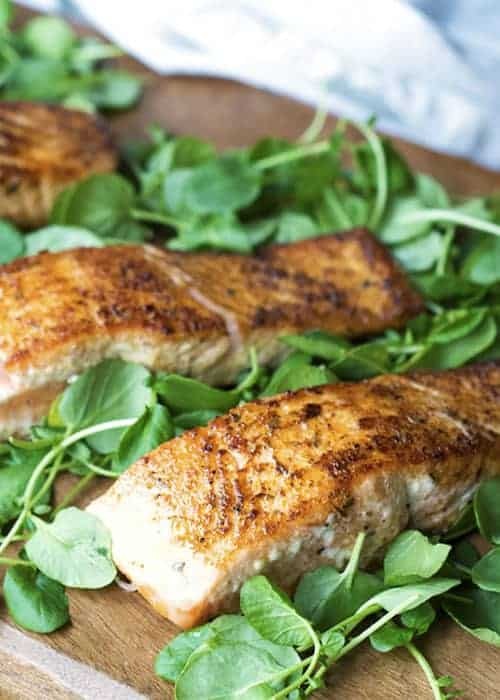 You can serve this salmon over greens, or I like it with Roasted Vegetables and All-Purpose Brown Rice. If you are being naughty try out some 30 Minute Mac and Cheese! 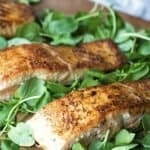 Simple Cajun Salmon only has 3 ingredients! This makes a perfect week night meal. It’s a fast and healthy recipe. 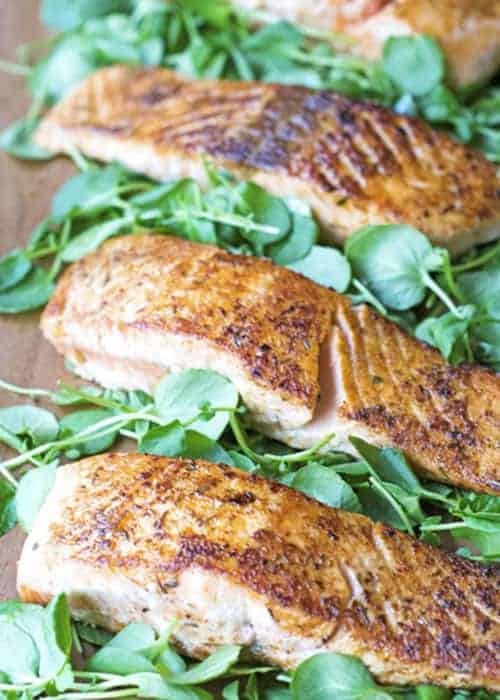 The Cajun spice is delicious on salmon! Heat up 1 Tablespoon of olive oil in a large skillet over medium high. Sprinkle 1 Tablespoon (or as much as you want) of Emeril’s Cajun Seasoning on top of the salmon fillets. Place the salmon skin down into the hot olive oil. Cook for 7-10 minutes, or until desired doneness.